While a student, Aviva launched an award-winning tech venture called BallotReady, that lets anyone find all the candidates and referenda appearing on their local ballot, along with useful information on each. She and I discussed with an audience of NYC-area UChicago alumni not just how she started the business, but also how Millennials view politics, how technology is changing attitudes about government and privacy, and how American politics is likely to realign in the wake of this year’s election. We’ll be repeating the experience in Chicago on November 30. That’s one of several November engagements I have scheduled. 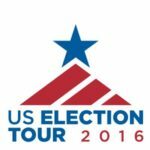 I’ll be in Washington all of next week for a series of events, starting with the U.S. Election Tour 2016, which is bringing several hundred political consultants and observers from around the world to the U.S. to see the final days of the campaign in action and attend seminars with many of America’s top campaign consultants from both parties. I’ll be moderating the final panel, just before the polls close on Tuesday, discussing what this election means to others around the globe, with Vladimir Putin’s favorite pollster, a pro-Brexit consultant from the UK, and leading consultants from Sweden, Mexico, and Turkey. The day after, I’ll be discussing the results and what comes next with a delegation attending from Sweden. 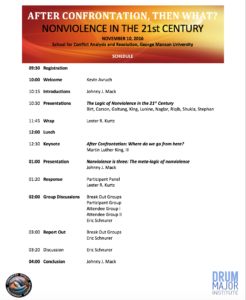 On Thursday, for a change of pace, I’ll be moderating another roundtable, this one with experts from around the world on the future of non-violence, at a conference led by my friend, Martin Luther King III. Last year, I was asked to read and review Clinton’s “Hard Choices.” (You can read the full review here.) While the book starts with an ambitious-seeming take on the need for a broader, futuristic rethinking of the aims of foreign policy, it soon becomes clear that as both an intellectual and operational matter Clinton is not broadly, futuristically focused (like, say, Obama).… [W]hile most liberals fear Clinton’s tendency to intervention, my concern as a “liberal interventionist” is not that Clinton is an interventionist – it’s that she’s a conservative, backward-looking one. Meanwhile, Obama is already worrying about what happens to all of us when the robots take over. Maybe she should keep him on to head strategic planning while she runs the day-to-day. I also received an invitation from the multi-talented Turkish politics and media guru, Necati Ozkan, to write a piece on the US elections for his glossy print magazine, MediaCat. 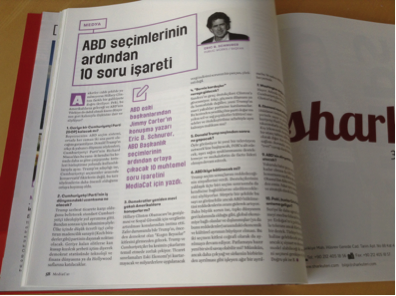 In it, I answer the “Top Ten Questions After the US Election,” ranging from #1, “Is there a Republican Party after this?” to #10, “What does this mean for the Middle East?” You can’t otherwise find the piece online (and you can’t read it, anyway, unless you know Turkish), but the full piece is posted – in English — below. Unless the polls are grossly inaccurate, Hillary Clinton is headed to a sizeable victory. What does this mean for the future – for American & for US relations with the rest of world (including Turkey)? Is there a Republican Party (GOP) after this? C’mon: The US electoral system pretty much ensures there always will be two major parties. Donald Trump’s racist & xenophobic appeals aren’t really different from how GOP has cobbled together its majority since Richard Nixon – he’s just less subtle about it. His candidacy simply has revealed that such appeals – not conservative ideology – are what most GOP voters care about. So where does the GOP (Business) Establishment go? Trump has broken with standard GOP ideology: He’s against free trade. For large-scale spending on middleclass (like rightwing populists around the world). Isolationist, dismissive of “American exceptionalism.” Turned the party into a howling mob of the less-educated instead of its usual Country Club veneer. The Elite thinks it gets its party back after Election Day. Wrong. My guess: Extractive industries in the country’s interior employing low-wage workers (like those owned by the Koch brothers) become the mainstay of the Party; the rest of the Elite swallow hard & join tech, finance & Hollywood as Dems, provided Dems ease off on taxes & big government. Do Dems ever talk to blue-collar America again? Dems have been headed in the pro-business, less-government direction since (Bill) Clinton. Hillary only exacerbates that. She’s shied away from Obamacare expansion & taxing the rich to pay for Social Security. Even in victory, she’s ignoring Trump’s Angry White Guy base – voters who used to be Dems. Trump & GOP hardly represent their interests: trade restrictions won’t save the Old Economy, & tax breaks for billionaires are part of the problem, not the solution. So will anyone speak for the disposed? Where do the “Bernie bros” go? Sanders’ young supporters don’t trust Clinton – in part see above, in part because they’re mainly male & misogynistic. But they’re not racist, anti-immigrant or homophobic so can’t join Trump’s blue-collar party. Can a new progressive party emerge from this mess, or are left- & right-wing populists doomed to remain separated by cultural issues & thus marginalized? What does Donald Trump do after the election? Looks like he’ll start a new TV network, out-fox FOX, keep the hard-right insurrection going, & remain de facto leader of the opposition. Does the US split apart? Trump has signaled he’ll reject the election results; about a third of his supporters say they’ll stick with him post-election – surprisingly few, but a growing faction who reject the US government. The bigger issue is the growing economic and cultural divide between those connected to the global economy & those left out of (or rejecting) it – as elsewhere in the world. Those two sets of voters are increasingly separated geographically. Volatile recipe for a new Civil War? Possibly – but more likely a slow separation (like oil and vinegar), not just in the US but across the world. Does Washington change at all? In fact, it gets worse. GOP digs in against Clinton more than Obama. Smaller GOP House caucus is more dominated by extremists who try to impeach Clinton from Day 1, & split between majority “crazies” & a small minority willing to work with Dems to avoid total shutdown – foreshadowing the realignment in #2, above. What happens to the economy? Government will deadlock for another 2 years and constantly battle GOP-induced defaults and shutdowns. Winter (and a recession) is coming. The shame: US economy is fundamentally sounder than anyone else’s, but our political system won’t take “yes” for an answer. And US role in the world? All the foregoing obviously weakens the US as world leader – but not as much as critics say, doubters fear, & Putin hopes. Clinton is more interventionist and assertive than Obama – but also more conservative tactically (i.e., cautious) and strategically (i.e., backing institutional players). What does this mean for the Middle East? More aggressive policy in Syria, political need to knock out ISIS. Turkey: More tolerance for Erdogan’s domestic politics, but continued support for Kurds. Turkey has the potential to be a major power this century – but faces a serious choice between (a) Putin & (b) US, as both international partner & domestic political & economic model. Correct choice: (b).